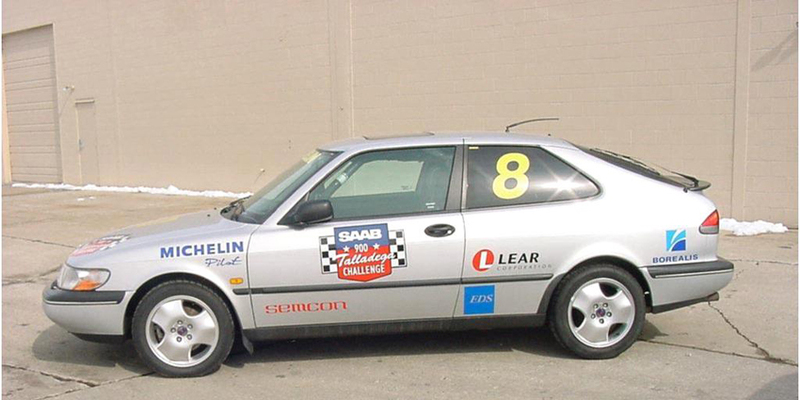 When the checkered flag fell at Talladega Motor Speedway on October 24 1997, a silver Saab 900 SE had covered more than 25,000 miles at an average speed of over 140 mph…and that includes time spent fueling and servicing the car! It is interesting to note that in setting these international records, the Saab 900 had to beat the previous world record…also held by a Saab…and set over 10 years earlier. Saab’s innovative water-cooled Garrett turbochargers and Trionic engine management system helped these engines and components endure strains that engineers never imagined. Exhaust temperatures of more than 1,800 degrees Fahrenheit and turbines spinning at almost 200,000 rpm for hours on end proved the durability and reliability of these powerful engines. After completing a distance the equivalent of one lap around the earth at full throttle, the Saab 900 SE Turbo and its V6 and non-turbo brethren had set 40 international records.